Enjoy a new gourmet kitchen with granite counter tops and new appliances and surf on your laptop with the house wifi. BEFORE ONLINE BOOKING, EMAIL ME TO CONFIRM THE WEEK IS AVAILABLE. If you like to walk or bike on the least busy stretch of beach on Kiawah island, where you can see a pod of local dolphins feeding in the Kiawah River, this is your place. Simply read the past guest's comments below and you'll see why this home is such a special place. The house has brand new Hardie board siding, new decking, new windows and a new roof. The dishwasher, refrigerator and oven are new. Rated the maximum 4 Stars by our management company, this is a home that is remarkably comfortable and relaxing and is why so many past guests return to this home. This beautiful, newly decorated home has hard wood floors and is located on a secluded dead-end street, surrounded by large Live Oak and Palm trees. It's a perfect family home with a large central kitchen-living room- dining room area, but yet has all the privacy you might want too. Many simply stay at the house by the pool, rarely leaving and others use this wonderful home as a central point to venture out for beach walks, kayaking and biking. Whatever you do at Kiawah, this comfortable home will welcome you back home. Conveniently located in the West Beach area, it's about a five-minute walk or three-minute bike ride to one of the least busy areas of beach on the island. A maritime forest nature walk next door adds extra privacy to the back yard. Also nearby are the West Beach Tennis Club, Cougar Point Golf, Night Herron Park, and the Straw Market. The new Freshfield's Shopping Village is only 2 miles away. This is no ordinary rental house and it is Available Year Round. Please check the rental calendar below for available rental times. View a video on youtube (ljpT1RotG0o). THIS HOME HAS SECURE WIRELESS HIGH SPEED BROADBAND INTERNET ACCESS. The NEW, PRIVATE 32 x 16 FOOT HEATED POOL (pool open April 1 - November 1) is one of the largest home pools on the island. The large, 50 foot long back deck is perfect for grilling or simply relaxing on rockers that overlook the pool and a large, private back yard, which enjoys a woods-view and is just off a bike/walking path. The covered front porches have old-fashioned porch swings and there's also a screened-in porch, which leads down to a 2-car garage. There is a new sound TV system in the living room and a wireless high-speed broadband internet connection. The open, fully equipped modern kitchen connects directly with the dinning and living rooms and all look out over the large private back yard. All bedrooms and living room have HD flat screen TV's. The Upstairs Master Suite has a king-size bed, sitting area, TV, DVD, large walk-in closet with a single fold up bed, private bathroom and its own balcony porch with a swing. Two other Upstairs Bedrooms have two extra long twin beds in each bedroom (four total extra-long twin beds) and HD TV in each room. The laundry room completes the upstairs. The Downstairs Bedroom has a queen-size bed and HD TV and . The large fully equipped kitchen opens to the dining area and living room, which has large comfortable sofas and chairs. Linens and bath towels are provided with the rental. If a deluxe private home with your own heated pool, near to an off the way area of beach is what you're looking for, you've found the right place. Please take time to read the past guest comments below. There's no other place like Kiawah Island. 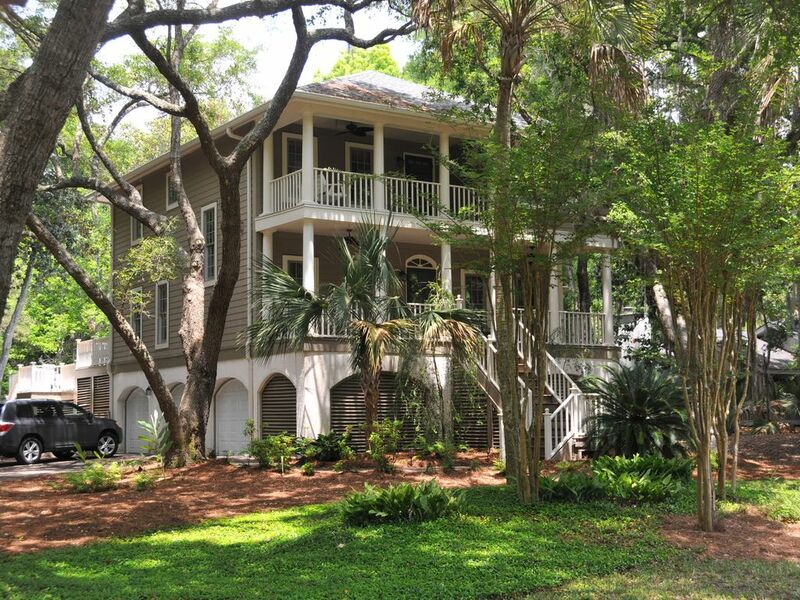 Only 20 miles from Charleston, it has golf, beach, biking, kayaking, among other things. The private pool is one reason so many people rarely leave the house. New granite counter tops and tile back splash. New cook top, new oven, new dishwasher, new sink. All TV's are connected to cable. This PRIVATE HEATED POOL (April 1 to Nov.1) is for this home only and has an water basketball goal.